So you all know that I've been a little Lulu crazy lately...I can't really help it: they opened a brand new store right next to my gym! Anyways, this morning, I decided to do quick peak and see if they received more colours in their Swiftly Tech LS (they are so comfy...my new favourite T now! 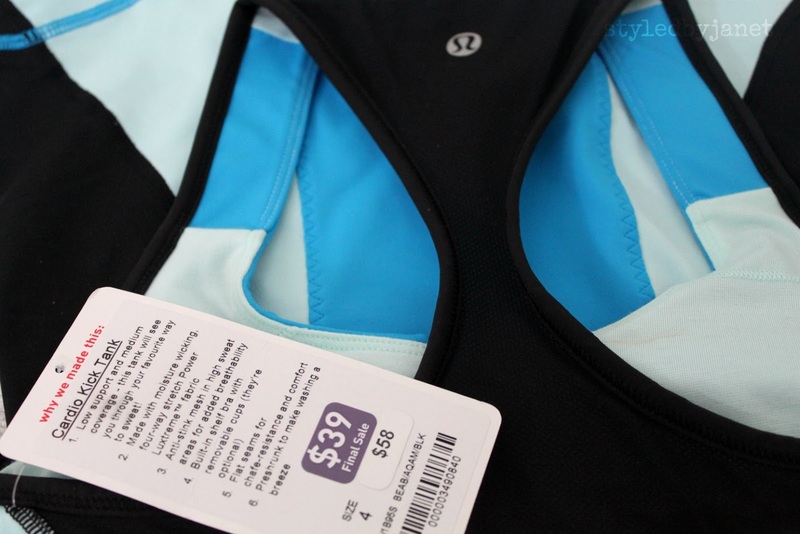 ), and came across these Cardio Kick tank on sale. Now, I've seen them on their website and love the colour blocking but never bother to try them on. At $39, I guess I don't mind spending an extra 10 mins! Wow! They fit like a glove! I love the wide slightly padded straps to high impact sports (I've been doing mostly cardio to lose weight). The mesh racer back is not only flattering but also keeps me cool (Being a heavy sweater so definitely can use the extra ventilation). And although all the colours are cute, I went for these two colour combo because of the black side and back panels, which create a slimming effect...almost like "shading". Yup, I can definitely don't mind some shading!